Year’s end typically brings about various group shows, yuletide-themed events, and the culmination of yearly titles such as residencies and fellowships for the art community. Whether you are an artist or an appreciator of art, now is also the time to reflect on all the awesome (or not so awesome) work which has been made or seen this year. For RVA Mag’s December First Friday picks list, there are a couple must-see exhibitions that are nearing their closing date, and three opening receptions to attend; one of which is the primo horned-holiday festival that’ll have you hoping you’re on Santa’s nice list this year. 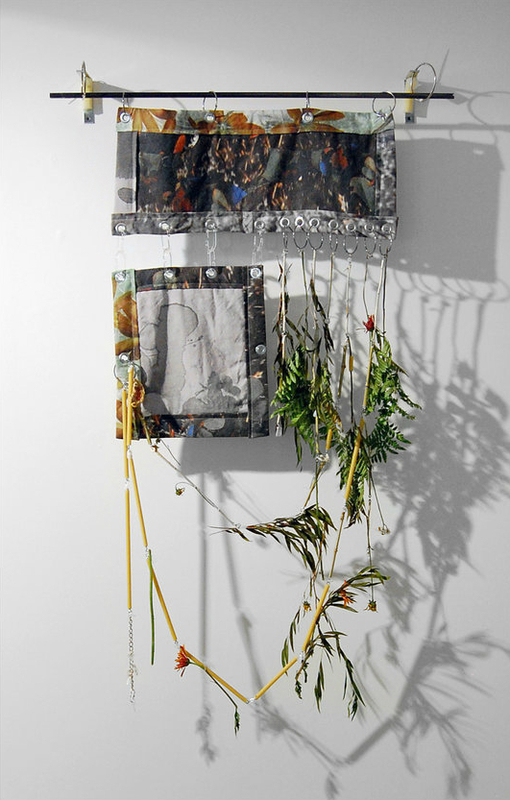 Exhibition runs through December 3, 207 W. Broad St.
RVA Magazine’s featured exhibition this month is Held in Large Hands, a solo show of Quirk Gallery’s current artist-in-residence, Grace Kubilius. Located in Quirk’s Mezzanine gallery, Held in Large Hands is a series of collaged hanging works that references conflicting perceptions and performance of (the female) self. 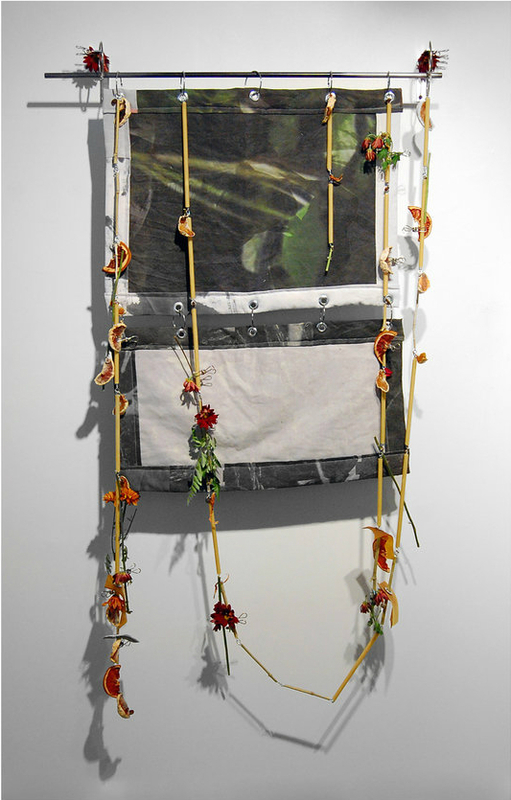 These works appear as semi-modal assemblages and comment on the self and social conditioning of female bodies through various ephemera and disembodied parts, represented through custom printed fabrics, flowers, shells, pierced skins, beads, makeup, and more. This is the last week to view this show, so do make your way to Quirk’s Mezzanine, as this exhibition also marks the culmination of Kubilius’s residency. RVA Mag was able to catch up with Kubilius this past week to get some insight into her work. Angela: Where are you from and when did you know you wanted to be an artist? Kubilius: I grew up in Chicago and have lived in Saint Louis and Baltimore. I danced ballet from the ages of 3-16 when I took some time off and began to take more interest in Fashion. Fashion eventually lead me to drawing and painting. I knew I wanted to seriously pursue art after taking several painting classes at the Art Institute of Chicago. Angela: What response are you looking for from your audience? Kubilius: I often reference my own (contradictory) female identity and use my body in my work. I try to be really honest; I feel I have to be. My work comes from a place of constant questioning and confusion. I hope that my audience sees that and I can relate. I hope they experience some sadness, discomfort, or delight. I hope they feel more than one thing at once—something a little messy, a little sweet. Angela: Did you go to school thinking you would make this kind of work? Kubilius: Yes and no. Prior to graduate school I was making performative, anti-fashion- garments in an attempt to reject notions of my perceived/ learned ideas of femininity and deny the body any articulated (female/ gendered) shape. I wanted a more complex conversation around female identity/experience, and it was necessary to shift away from working with garments that require activation from a living human body and further distance myself from the continual practice of looking at, dressing, and touching woman’s bodies, which had become an avatar for my own (flawed) body. In school, I made new bodies, addressing a female body that is not an actualized body – a body in parts, a possible body, a body nonexistent. I continue to develop my own vocabulary in my work, collecting cultural detritus and architectural debris like rotting, paint- stained wood or flowers and twigs reminiscent of childhood play. I engage with dirt/dirtiness and an exaggerated idea of “sweet” using beauty products like false nails and eyelashes. I collide (pierce, tether, string) these components in a way that makes sense to me (rationalizes them) and frames girlhood and womanhood together- messy and fucked up. I choose material (based on cultural and narrative associations) that has a gendered or bodily potency. I am interested in objects that exist in the world as structures already created that shape behavior. What is tainted? Angela: What artists have influenced your work? Kubilius: Donna Huanca, Athena Papadopoulos, Caroline Achaintre. I am also very influenced by writing and language- Sheila Heti and Kate Zambreno are two authors I continually reference. Angela: How has it been working with Quirk? Kubilius: Quirk has always felt like a second home to me. As an artist-in-residence, Quirk provided me with a live/work space just down the block from the gallery. The residency program is also partnered with the Visual Arts Center which afforded me the opportunity to use their studios, help out with classes, and take classes. During my time with Quirk and VisArts, I was able to host a pop up shop for some of my jewelry and wearable pieces at Quirk, create an installation for one of the project spaces at CURRENT Art Fair, and end the residency with an Exhibition in the Mezzanine. Both Quirk and VisArts have been incredibly generous and provided me with the help and resources to maintain my practice and follow my interests as I transitioned out of graduate school [at VCU]. I am profoundly grateful for all of the opportunities and beautiful people from Quirk and VisArts that have continually extended their support. Opening reception Fri., December 1, 7 -10 pm, 509 E. Franklin St. VALET will host the opening reception for Softcore, a joint exhibition of new works by Richmond artists Théo Bignon and Tyler Stoll. Like Kubilius’ show at Quirk, Softcore also comments on body and identity perspectives, but here Bignon & Stoll present their works in conversation on queer experience. Bignon’s works enter the dialogue by questioning sexualized connotations of kink and masculinity associated with men’s underwear and bodily presentation. Bignon manipulates the fabric into the antithesis of the way briefs are classically displayed on firm mannequins or model bodies by stretching the underwear like a canvas, hanging them draped from walls, or embellishing them with beaded fluids. These unconventional ideations or alterations of underwear, therefore, work against ingrained social stigmas associated with queer masculinity. Stoll also plays with these attributes in his work by casting seemingly soft and light corporeal shapes out of concrete and plaster. These biomorphic forms retain a heavier mass than meets the eye, which seems to transfer symbolically as embodiments of discomfort, inhibition, and stagnancy that weight social presentation and relationships. Consistent in his craft, you may also recognize some of Stoll’s jewelry work from the Quirk Gallery store. These pieces, too, seem to meditate on similar formal precepts through encased or interlocked organic forms and masses. Open thru December 2, 319 W. Broad St. If there were ever to be an art opening sponsored by the Science Museum, this would be the one. This is the last week to see Sarah Nance’s an inventory of moons, which is closing this coming Saturday. Nance, based out of Montreal, uses elements of “light, geology, and time” to construct various site-responsive installations that are “uniquely about a place.”. These works are varied in material and structure, as the show’s cohesiveness is held in concept. 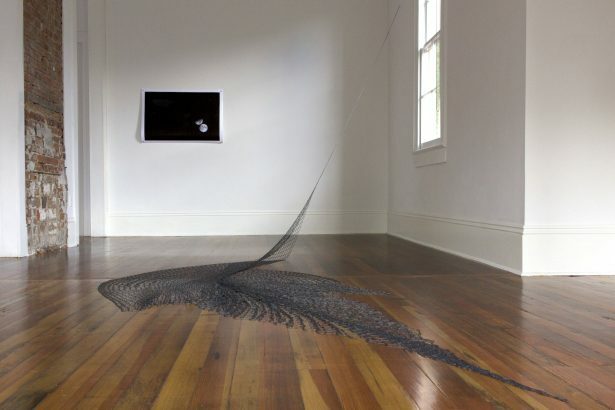 One work, to reinforce a glacier, is a hand-beaded net of expansive size that was at one point positioned to ensconce a glacial formation in Iceland; another work, telluric, is comprised of a number of recovered micrometeorites clinging to a large magnet projecting from the gallery wall. These works provoke a de-centering experience for viewers, inviting contemplation beyond measures of terrestrial presence. An inventory of moons also features the sound piece Sonification 15 – Sea of Showers with Nance’s collaborator, Burke Jam, of Portland. For this work, the entire 1708 Gallery has essentially been transformed into a chamber for reading “moonquakes”, or physical lunar seismic events, by installing four surface conduction drivers on the gallery walls. Through a process called sonification, the setup translates subtle sonic signals, inspired by the four moonquakes from the Apollo 15 mission, that resonate through the gallery walls as delicate, audible sounds. This didactic work invites audiences to explore the physicality of lunar phenomena, a kind of isolated meditation since geologic events like these are infrequent and fleeting. 7 pm -12 am, 200 W. Marshall St.
What a tradition! 2017 marks the fourth annual Yuletide Monsters: A Krampus Art Show held at Gallery 5. This large, multi-media group exhibit features the work of over 20 local artists whose work celebrates the yuletide lore of the half-goat, half-demon Krampus—punisher of miscreant children for their naughty deeds come year’s end. For historical reference, the Krampus tradition was nearly halted at the beginning of the 20th century (some Christian leaders in Austro-Europe did NOT deem this child snatcher quite appropriate), so here is the time to celebrate the resurgence of this alternative evil-Santa lore in full force. This event has become somewhat of an institution in town, and it’s always a hoot to see the many zany and inventive interpretations of Santa’s evil helper. New this year, the event will feature large-scale projections by video artist Doc Jim on the outside of the G5 building. This high definition 3D mapping of Krampus imagery will surely bring this legend to its true larger-than-life status. If you can’t make it out Friday, don’t fret, the show will remain installed throughout December for all of your many and varied Krampus celebrations. The First Fridays event is free and will include live musical performances throughout the night, as well as the “Holidaze Market” with booths by various vendors and community groups. There will also be a special screening of Greetings From Krampus (filmed locally by Red Love Productions), and a toy drive to benefit Scares that Care (a charity organization dedicated to uniting horror fans to help sick children and women fight breast cancer). Of course, do not forget about the annual RVA Krampusnacht “Krampus Walk” that takes place the next day, Saturday, December 2. Participating artists include: Amelia Blair Langford, Charles Berger, Brad Douglas, Brandon Dawley, Brit Austin, Dave Parrish, Doc Jim, Lady Octavia, Lonecrow Couture, Jarred Barr, Josephine Russell, Jean Baptiste Stowell, Hope Martin, Nick Bryant, Nico Cathart, Nicole Pisaniello, Red, Onca O’leary, Richard Bargdill, Samantha Grace Randolph, Samuel J. Vaughn, and Steven Warrick. Opening Friday December 2, reception 6-8, runs through January 13, 1625 W. Main St. Opening Friday, Page Bond Gallery presents Glow Glimmer Sparkle Shine, a group show of 26 artists exhibiting works that embody the exhibition title in form or in concept. Although a little off the beaten path of the Broad Street Art Walk stretch, the Page Bond Gallery is less than a mile and a half away on Main Street, so no excuses! The opening reception runs from 6 – 8 pm, so perhaps make this one of your first stops of the night before venturing further downtown. In the figurative paintings of Richmond artist S. Ross Browne, presented are themes of prevailing resilience, despite socially “imagined mythologies,” to challenge the racial stereotypes so ingrained in American culture. 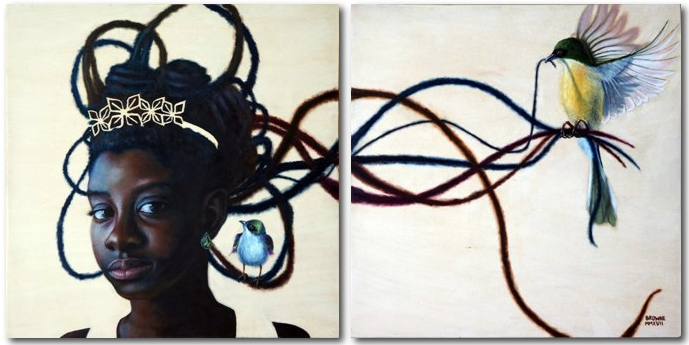 Browne incorporates natural and cultural forms such as birds, land and cityscapes, jewelry, and period clothing in rendering “the struggles of identity, power, and self-actualization.” His painting, Gamine Nserewa, features a young woman adorned in a golden crown, with colorful birds arranging her hair across the canvases. Piero Fenci’s sculptural ceramics recall the sharp angles and curves of industrial machinery, armor, ancient architecture, and vessels that he characterizes as “loosely rendered reinventions of the past” that reveal “a heritage of [my] own passions.” These forms are enhanced by Fenci’s fantastic use of glazes, with various surface qualities ranging from shiny and smooth, to dripping and crackled, to rusty and patinaed. Participating artists include: Isabelle Abbot, Will Berry, Karen Blair, Sanford Bond, Robin Braun, S. Ross Browne, Amy Chan, Charlotte Culot, Clark Derbes, Sean Donlon, Piero Fenci, Isa Newby Gagarin, Sarah Irvin, Harris Johnson, Becky Joye, B. Millner, Sarah Mizer, Jaydan Moore, Matthew Langley, Tim O’Kane, Corey Pemberton, Curtis Ripley, Fiona Ross, Nancy Murphy Spicer, Leigh Suggs, and Julie Wolfe. The weather looks like it’s going to give us another nasty weekend, but that doesn’t mean you can’t get out and enjoy a little art. There are plenty of happenings, music, artist showcases, exhibits and other events going on at tonight’s First Fridays Artwalk. Created in 2008 on the 30th anniversary of the non-profit arts organization 1708 Gallery, InLight Richmond was born as a “public exhibition of light-based art and performances.” The Gallery hopes the project gives something special and unique back to the community, and it’s pretty easy to see it does. In order to incorporate and celebrate all of the different great places within Richmond, the 1708 Gallery holds this exhibit at a different location in Richmond each year. This year the designated location is in Shockoe Bottom along the Riverfront Canal Walk. Shockoe, Richmond’s oldest neighborhood, is the site of many historical buildings, the Canal Walk, and the Richmond Slave Trail. It was also the first site in the world with a triple main-line railway crossing which is still visible today. It doesn’t hurt that Shockoe is also the original site of the 1708 Gallery when they were located on East Main Street. 1708 receives about 80 to 90 proposals a year for the project, artists are juried to get into the show. “One of the objectives, in addition to picking the strongest projects, is also picking artworks that communicate with one another and communicate with the site,” said Emily Smith, the Executive Director for 1708, of the initial selection process for the project. During the show, artists are juried again. “The juror selects the best in show. He’ll select that the night of. There’s also the ‘Best In Green Award’ where we invite someone who is familiar with green technologies or green sort of politics etc, to award a project that best addresses green issues or eco-friendly issues. There’s also a ‘People’s Choice Award’ that the audience can vote on through text messaging,” Smith explained. This year’s juror is Ken Farmer, Co-Founder and Creative Director of Nuit Blanche New York, a company that designs and produces installations, A/V performances, exhibitions, and various large-scale events. NBNY is perhaps best known for its signature event “Bring to Light: Nuit Blanche New York”, which is a free art festival on the New York waterfront. Farmer is also the co-founder of DoTank Brooklyn, a collaborative community of urbanists and artists who hope to enhance their cities through small-scale change. “We want the audience to be aware of the real beauty of the city but also experience it in a very unique and a kind of magical way,” Smith said when explaining what 1708 Gallery wants the audience to take away from this experience. The one-night festival will kick off with a Community Lantern Parade on Friday, November 8, 2013 from 7:00 p.m. to Midnight. InLight will take place along the Riverfront Canal Walk between the Turning Basin and 17th street. In addition to light installations, there will also be food tucks and performances. Check 1708 Gallery’s website for more details regarding the event.